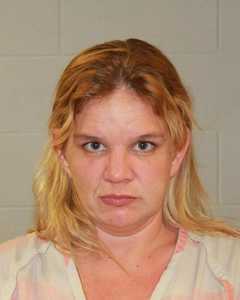 WASHINGTON CITY — Washington City Police arrested a 34-year-old Wyoming woman Wednesday morning on charges of drug possession and driving under the influence with a child in the vehicle. Washington City Police Officer Chandler Prince was dispatched to a suspicious situation at 850 W. Telegraph St. in Washington at 2:24 a.m. Wednesday, where he found Toni Lee Ryan, of Riverton, Wyoming, in the driver seat of her car with a child in the back seat. Ryan told Prince she was driving from California to Wyoming and had been on the road since 7 a.m. Tuesday, according to a probable cause statement filed by Prince in support of the arrest. Due to the offense location being in the same parking lot as Paul Mitchell The School-St. George, Ryan’s charges were enhanced for possessing drugs in a drug-free zone. Ryan was arrested and charged with one second-degree felony for possession of a schedule 2 drug in a drug-free zone; one third-degree felony for child endangerment; one class A misdemeanor for possession of drug paraphernalia; and once class A misdemeanor for driving under the influence with a child in the vehicle. Ryan was booked into the Washington County Purgatory Correctional Facility Wednesday. Her bail stands at $13,370. Give her a break! She was just trying to fit in with the local drug users. Child endangerment? Where was the child endangerment for the woman who cooked her kid in the car? This woman was not a Mormon, thus- guilty. Really? A hair school? While I don’t condone her actions, I think the Paul Mitchell school shouldnt be considered a “drug free zone” like it would an elementary, middle or high school. Looks like they are stacking charges so they appear generous when they drop some of them.